“Think of the thing you are most afraid of in the world…” Rebbetzin Tziporah Heller instructed us at last night’s class. About half the hands in the room shot up. Laughter fills the room. Right, Rebbetzin. “Moving on…How many of you have been to Niagara Falls?” Again, about half of the hands in the room shot up. “You would die!” a woman in the front row offered. “Yes, you would die.” And then she went on to talk about Shvirat HaKelim, the breaking of the vessels. When our vessels are, like that ill-fated wine glass, too restricted and fragile to contain Hashem’s abundance so they shatter instead. And Rebbetzin Heller explained that when you see that mouse, or any fear, you can choose one of two reactions. You could scream “Moooooouse!” or you could tell yourself that facing this fear instead of fleeing from it is making you stronger. It’s making you greater. It’s transforming you into an expansive and solid vessel that can contain whatever Niagara Fallses life sends your way. And then Rebbetzin Heller concluded with a story, about a 19-year-old relative who was spending his summer vacation driving travelers home from the Los Angeles Airport. One Friday, that relative was driving home his final passenger when he found himself in a huge frozen-molasses traffic jam. Hours and hours passed. Until the relative looked at his watch and realized that it was 6 PM. He promptly pulled over to the side of the highway, and explained to his passenger that he was very sorry, but he was Jewish, and for Jews Saturday actually starts on Friday, and from that moment on he wasn’t allowed to work any more. But the teenager wouldn’t budge. He wasn’t afraid of this passenger. Because he had only one fear: fear of G-d.
And that passenger came to Israel and became religious, and was reunited with the man who had infuriated him so deeply but ultimately inspired him so powerfully, by showing him that it is possible to live without all the false fears that fill our minds and our hearts. Fear of poverty and embarrassment and loneliness and illness and death. Because while danger is real, fear is our choice. 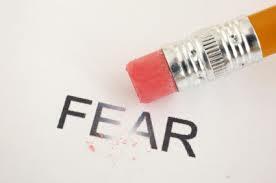 Fears, in reality, are nothing more than the stories we tell ourselves. And ultimately, we human beings should really only have One True Fear. From seeing a woman who is overcoming grief and shock and fear to continue serving Hashem by spreading His Torah and His light to His daughters who need and love her so much. I heard this class at a benefit evening for Rena’s Place/Aishel, a therapeutic group home for homeless Jewish girls. Reb. Tzipporah Heller is a very special kind of role model. Thank you for sharing. I especially enjoyed your thoughts at the end.